This test is 15 multiple choice and one extended response question. The test includes questions like- identify the character trait that best describes Leona? What is ironic about Curtis's story? and also a few questions on figurative language in the story. 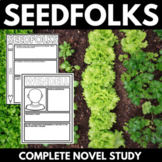 Final Assessment for the novel Seedfolks. This packet provides detailed questions for students to answer while reading through Paul Fleischman's Seedfolks. It also goes along with the final test that I have posted and can also be used as a study guide.